We built an initial business website using a simple design theme and later whilst design was organic, the graphics were enhanced by Ruth Graham to add a much better finishing touch. We optimised the website and trained the client on managing their own new site, It is a project that is being developed in phases because of budget constraint and cash flow. As turnover increases we add more and more elements to the site and there is a very clear, agreed pathway for this project. 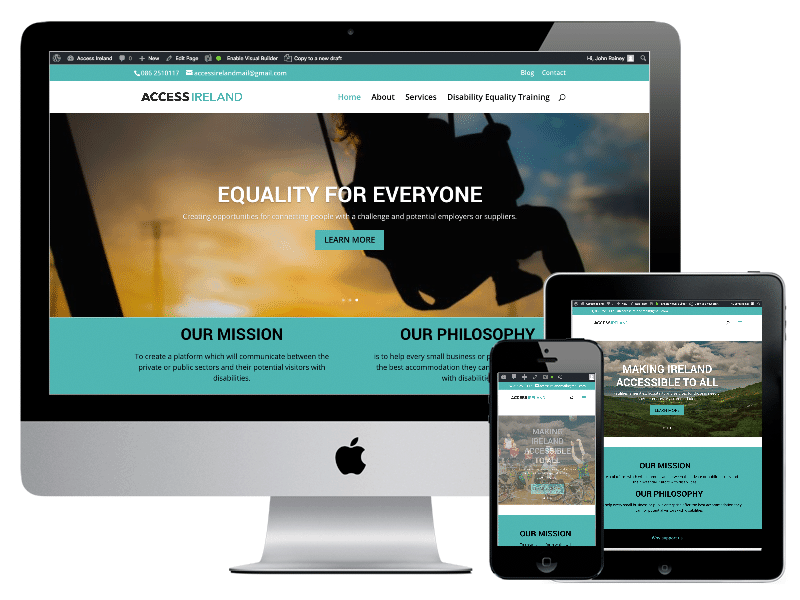 Access Ireland have a website that accurately reflects their activities, values and ambitions. The enterprise is still in its infancy, but has such great potential, so the website will grow with the business. It will continue to reflect the enterprise as it grows. The site ranks extremely well for all agreed keywords and terms. Initial results include that Access Ireland look professional and this is reflected in the attitude of potential clients when they are approached, who then do their own research in to Access Ireland. Feedback has been great and our clients are delighted.